Our 3 hour Fire Safety Awareness training course covers the legal requirement to make sure every member of your team knows what to do in the case of fire. Whether you need to provide fire safety awareness training for new employees, or carry out the annual refresher training that the law requires, we can help. Our chief trainer has enjoyed a senior career in the fire brigade and is now an internationally recognised expert in his field. Our fire safety training team covers the whole of London and the South-East and will usually deliver the Fire Safety Awareness course at your own premises for your convenience, although we are able to organise an alternative location for an additional charge if you prefer. 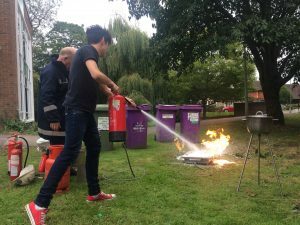 Our Fire Safety Awareness course is fun and interactive and will give your employees all the knowledge they need to keep them safe in the event of a fire. Who is the Fire Safety Awareness course for? We cover the whole of London and the South-East of England and usually hold the Fire Safety Awareness training at your own premises or, if you prefer, we can organise a local venue for an additional fee. Please note we don’t recommend training in groups larger than 15 people.